The eruption of Mount St. Helens is one of my first memories of the world outside my immediate home and family. 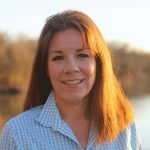 As a first-grader, I remember watching the evening news with my family and seeing people covered in suffocating gray ash climb out of a military helicopter. Since then, I’ve wanted to witness the aftermath of the most destructive volcanic event in U.S. history and share it with my kids. Mount St. Helens was once a recreational playground for Washington, similar to Mount Rainier National Park. Until one quiet Sunday morning in 1980 when the snowcapped mountain vaporized and a mudslide decimated a forest for a generation. In 1792, British explorer Captain George Vancouver officially named Mount St. Helens after Baron St. Helens, an ambassador. The Cowlitz Indian Tribe and Yakama Nation’s name translates into the smoker, suggesting a history of volcanic activity. On March 20, 1980, a 4.2-magnitude earthquake rocked Mount St. Helens and jumpstarted the volcanic activity. Within a week, steam started to vent. Volcanologists from around the world camped out watching Mount St. Helens from every vantage point. By the end of April, a bulge appeared on the north side of the mountain. After weeks of speculation and intense monitoring, Mount St. Helens erupted on May 18, 1980. Geologists compared this eruption to Mount Vesuvius. It all started with a 5.1-magnitude earthquake that melted the snowpack into a violent mudslide and pulverized the top of the stratovolcano. For the next 9 hours, a plume of ash soared 12 to 16 miles into the atmosphere that turned day into night. The eruption generated 3.9 million cubic yards of material, like ash, pumice, trees and boulders that rushed 17 miles downstream. In all, the eruption of Mount St. Helens killed 57 people. In its wrath, it destroyed 47 bridges, 15 miles of railroad, 185 miles of highway, and 250 homes. This was the deadliest and most economically destructive volcanic event in U.S. history. After the eruption, Mount St. Helens went from a 9,677-foot peak to an 8,363-foot crest with a one-mile wide, horseshoe-shaped crater. Since the 1980 eruption, Mount St. Helens continues to rumble with the creation of several lava domes and intermittent episodes of venting steam. Because of the continued volcanic activity, the majority of the area is closed to visitors so scientists can continue their monitoring. The Johnston Ridge Observatory is a must for school-age kids with live seismographs and geologic exhibits. The visitor center offers two different films that my school-age kids enjoyed. These films might be intense for preschoolers and too loud for babies. 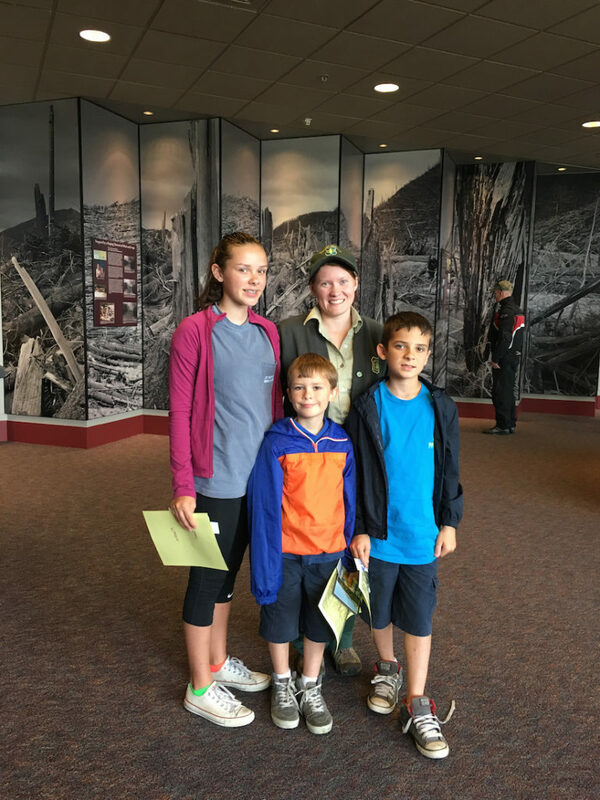 During our visit to Mount St. Helens National Volcanic Monument, my kids, 8, 12 and 13, attended a Junior Ranger program. The program explained the eruption in a way kids could understand. The program took less than an hour. Parents could stay or explore the monument on their own. Tour the Johnston Ridge Observatory’s visitor center and watch one of the dramatic films. If a ranger program is available, attend it. 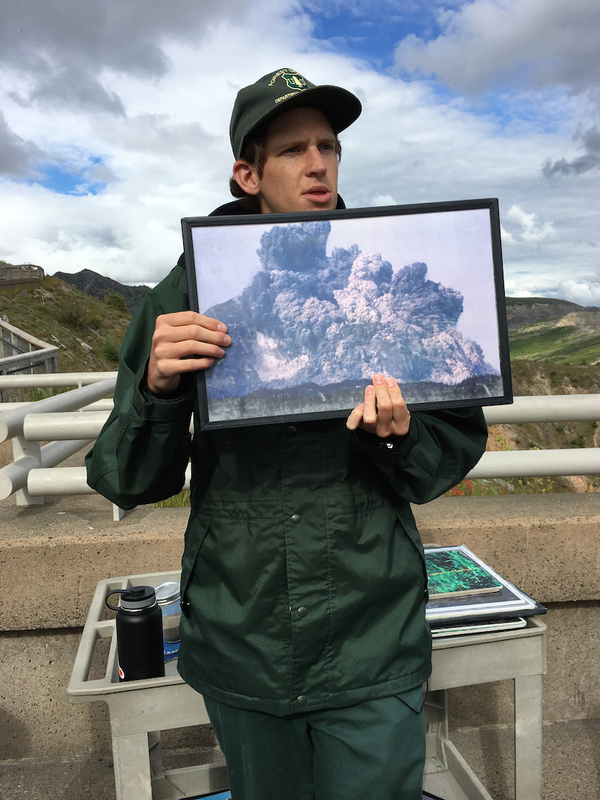 Our program offered amazing historic photos of the eruption. 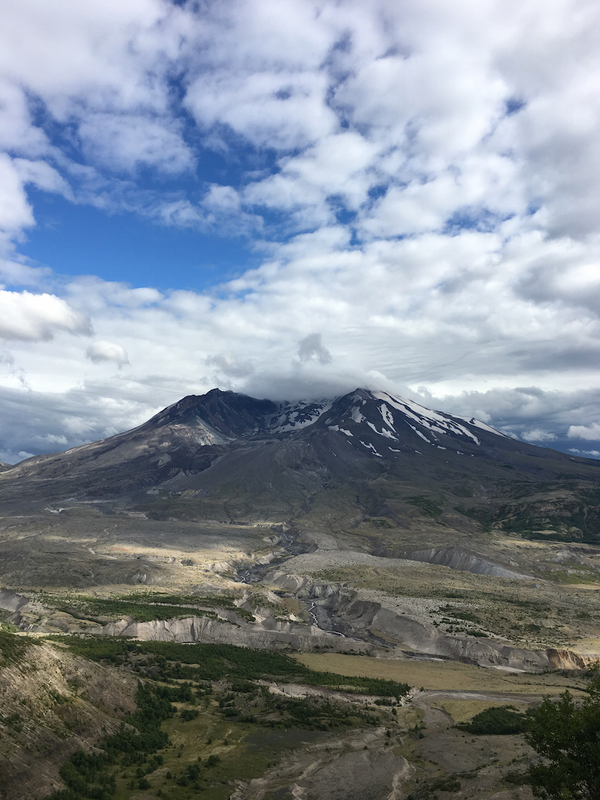 We hiked the Eruption Trail, a .5-mile trail from the Visitor Center to see the lava dome and crater along with a pumice plain and landslide deposit. If time permits, stop at the Loowit Viewpoint, just west of the Johnston Ridge Observatory. Due to the delicate nature of the recovering landscape, activities remain limited at Mount St. Helens National Volcanic Monument along State Route 504. Coldwater Lake Recreation Area offers a picnic area, interpretive trail, and boat launch, located 10 miles west of Johnston Ridge Observatory. Mount St. Helens Visitor Center at Silver Lake is a Washington State Park that offers exhibits on the 1980 eruption. Located 6 miles from Castle Rock along State Route 504, it’s open from 9 a.m. to 5 p.m. during the summer season. Try the eastside or southside of Mount St. Helens for more recreational activities, like Lava Canyon, Ape Cave or Spirit Lake viewpoints. Stop at Eco Park Resorts for its horseback tours, the closest to Mount St. Helens, that ride through the blast zone. Under flickering gas-powered lights, I read a book aloud to my kids as we settled in for the night under our cozy patchwork quilts. Set in a pristine landscape in the shadow of Mount St. Helens, it’s hard to believe the destruction that happened 36 years ago. 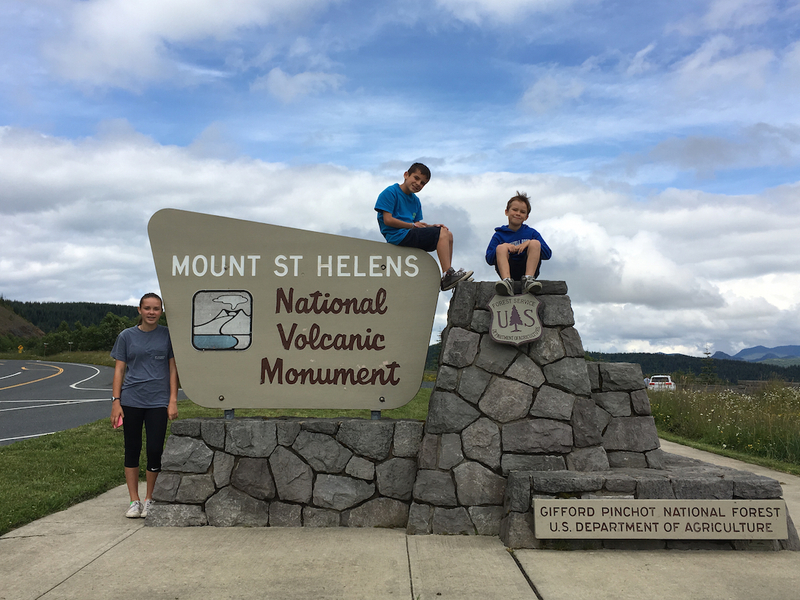 For my visit to Mount St. Helens, I decided to stay as close as possible to the site. At Eco Park Resort, just 25 miles west from the Johnston Ridge Observatory, I found several cozy, off-the-grid cabins along with tent and RV camping that unplugged my kids and recharged my spirit. Our cabin featured a pair of bunk beds that my boys fought over (in a good way) and a full-sized bed. A couple of quilts covered the beds to keep warm on the brisk Washington nights. Since the cabins lack electricity, light is provided by two gas-powered, wall-mounted lamps. Providing a flickering glow and igniting my boys’ pioneering imaginations. Outside our cabin, I made dinner on my gas camp stove at the picnic table. My daughter swung on the porch swing of the cabin’s back porch. As we looked across the grassy meadow, we saw the first flickers of the nightly fire in Eco Park’s fire pit, while my boys played in the late afternoon sun. Inside our cabin, I found a table with four chairs, perfect for games after dinner. The long counter on one side of the cabin offered ample space for organizing camping equipment. The owners of Eco Park Resort, Dawn and Mark Smith, offer their personal experiences of the day that Mount St. Helens erupted. The Smith family resort, Spirit Lake Lodge fell victim to 500 feet of ash that day. As the land recovered, the Smith family returned and opened Eco Park Resort in 1995 at 14000 Spirit Lake Highway (State Route 504). The Johnston Ridge Observatory is located 52 miles east of Castle Rock, Washington, along State Route 504 (Spirit Lake Highway). Mount St. Helens is located 110 miles northeast of Portland, Oregon, and 150 miles southeast of Seattle, Washington. Both cities offer international airports. The closest towns with traveler’s services are Castle Rock or Kelso, both along Interstate 5. Public transportation is not available to the Johnston Ridge Observatory. Columbia River Gorge National Scenic Area offers more lodging options along with a scenic drive, just 165 miles away. 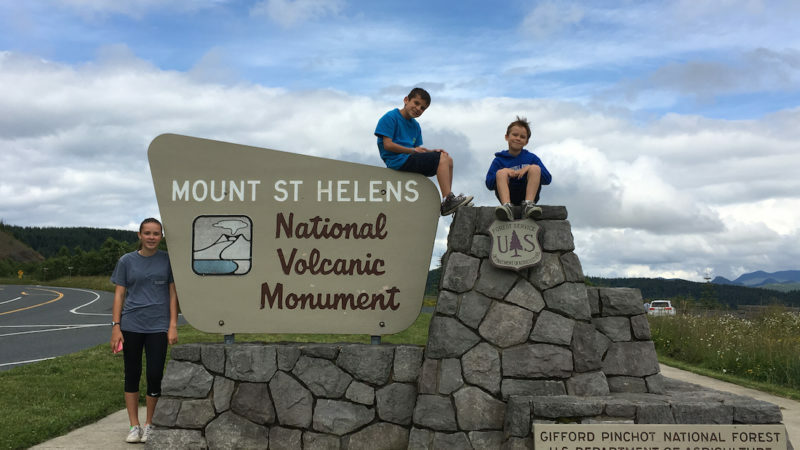 Mount St. Helens National Volcanic Monument is open 7 days a week from mid-May until the end of October, from 10 a.m. until 6 p.m. Use an America the Beautiful annual pass ($80) or purchase an adult admission for $8 per person, kids 15 and under enter for free. Mount St. Helens National Volcanic Monument’s Johnston Ridge Observatory is closed from the end of October until mid-May. 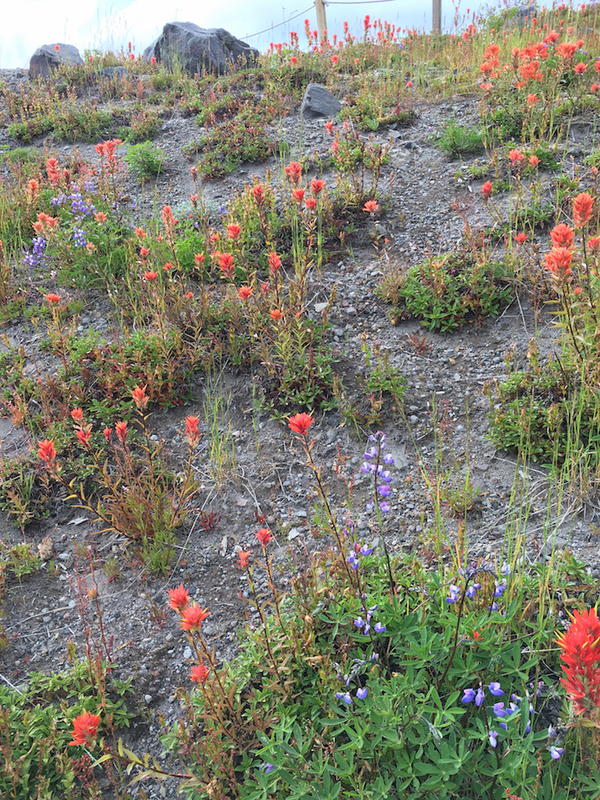 Mount St. Helens include levels of restricted areas for safety and the protection of the recovering landscape. Pets, bikes, and horses are prohibited to protect the recovering landscape. Though a few bike trails are open. Camping is prohibited at the Mount St. Helens National Volcanic Monument. Eco Park Resort is open from May until November and reservations are required. Bring a battery-operated lantern for your stay at Eco Park Resort for additional lighting in the cabin and making after-dark runs to the potty. Individual ground fires aren’t allowed at Eco Park Resort, though they light a fire pit that guests can enjoy. Remember the marshmallows! Due to the remote location, Wi-Fi is not available at Eco Park Resort, though I had reliable cell service. 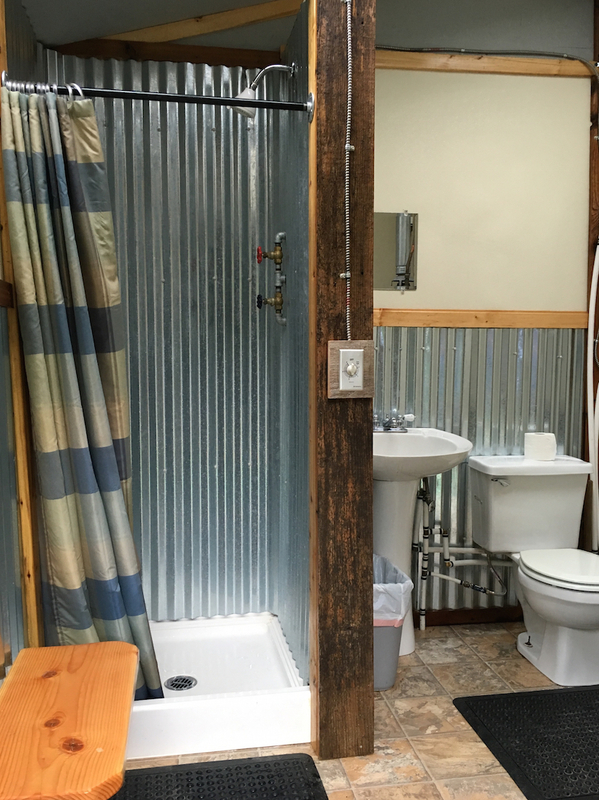 Since the cabin is off-grid, no electrical outlets are available in the cabin. Remember to charge the phone before arriving. The cabins are heated though I didn’t turn on the heat for my stay. The hot water is on a timer and the bathrooms contain showers only. The doors lock. If you have little kids, I recommend staying with them. 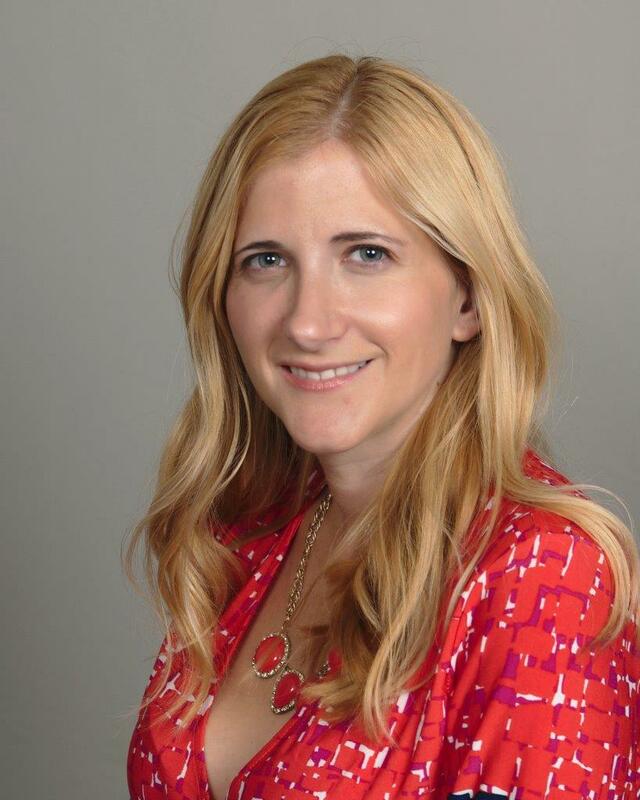 Previous Post: « Is the Mall of America Fun for Tweens? Love this post. I have not been to the area in years. You’ve inspired me to want to go back. It’s a fabulous destination for families since many parents remember the explosion which some how makes it for real for kids. That and kids love volcanoes! I’ve never been, but my boys are already fascinated with Volcanoes will have to go sometime! Be sure and stop at Mt. Rainier National Park too. Kinda a before and after for kids. The movie might be intense for some kids but boys that like action will love it! Have fun!